When we used to live in the Sacramento, California area, the caterer Food for Thought, at one time, had a small restaurant attached to their catering business in mid-town. We absolutely loved this restaurant for the soup! We would order an entree, but by the time we had their sumptuous soup and bread, we were really not interested in the entree. Their soup was that good! This soup reminds me of the type of soup Food for Thought would serve. The blend of spices and vegetables gives a great full-bodied flavor to this soup. Top with some grated cheese, sour cream, cilantro, and baked tortilla strips and you are all set! 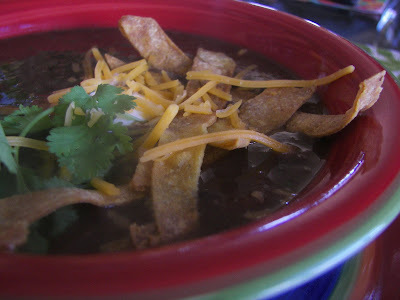 This recipe was inspired by the Spicy Black Bean Soup recipe printed in the April & May issue of Taste of Home magazine. It was submitted by Tia Musser from Hudson, Indianna. I have made a few changes to the printed recipe. 1/4 cup cilantro leaves -- Use more or less depending on how much you are a fan of cilantro. In Dutch oven saute onion and peppers in oil until tender. Add garlic. Cook 1 minute longer. Stir in the beans, broth, tomatoes and chopped green chiles. Bring to a boil. Reduce heat and simmer uncovered for 20-25 minutes. Add cilantro and cook about 5 minutes longer. Remove from heat and cool slightly. Place about half of the soup in a blender and cover and process until pureed. Do not skip the step of pureeing the soup! Return pureed mixture to Dutch oven and heat until thoroughly warmed. 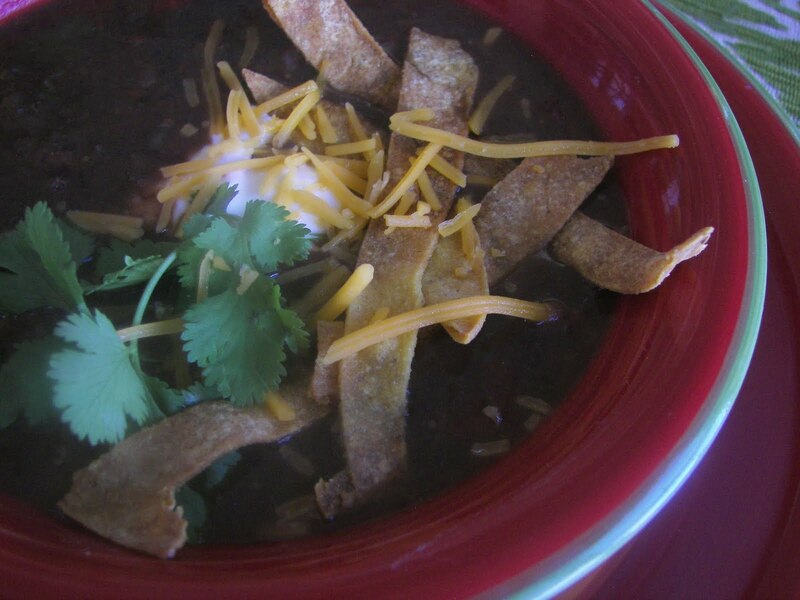 Top each soup serving with cilantro, 2 tablespoons of sour cream, 1 tablespoon of cheddar cheese, and tortilla strips. Cut corn torillas in long strips and coat with a small amount of olive oil and scant amount of salt. Place on cookie sheet in 350 degree oven for about 10 minutes or until lightly browned and crunchy. Turn strips over several times while cooking. I am Posting this With Blessed With Grace's Tempt My Tummy Tuesday. Click on the logo below to view other yummy recipes. I have also posted this with All the Small Stuff's Tuesdays at the Table. I have also posted this with Tasty Tuesday. I love black bean soup. This recipe sounds really good. Thanks for sharing. Oh, this sounds delish! I love bean soup! Found you from the UBP 10 Party, so glad I found this great site!! Now following you via google connect, you can also follow mine at www.safehomehappymom.com and enter the amazing giveaways I have on my blog. I make black bean soup a lot and we love it. Great looking soup! 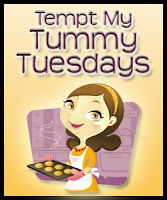 Thanks for linking to Tempt My Tummy Tuesday. Hi! I'm Tia Musser and this is actually my recipe! :) I'm glad that you liked it!